The European automobile industry has been working hard to drive down emissions by investing in new technology. However, joining forces to reduce CO2 emissions will allow us to drive down total road transport emissions more effectively, and will also ensure that Europe’s strategic automotive industry retains its competitiveness in the decades to come. Transport is currently responsible for around a quarter of total greenhouse gas emissions, with road transport representing 17.8% of total emissions, arising from the use of vehicles. Of this, all heavy-duty vehicles in Europe combined account for 5% of Europe’s greenhouse gas emissions, while they are responsible for carrying 75% of all land-based freight. As a comparison, energy supply is responsible for 30% of emissions and industry for 19%. The truck industry remains committed to continuing to lower greenhouse gas emissions through more fuel-efficient technology (such as common rail injection, GPS-based automated gearboxes, highly-efficient exhaust after-treatment systems). This comes in addition to further improvements of combustion and air handling, aerodynamics, low rolling resistance tyres and advanced control systems. Between the early nineties and 2013, the main focus of policy makers and the industry was on achieving dramatic decreases in pollutant emissions, such as nitrogen oxides (NOx) and particles (PM). To that end, six sets of ‘Euro’ standards were introduced in just over 20 years. As a result, pollutant emissions from the latest Euro VI heavy-duty vehicles have been slashed to near-zero levels. However, it should be understood that reducing pollutant emissions requires conflicting measures to reducing CO2 emissions. This ‘technological trade-off’ made it extremely difficult to decrease CO2 emissions simultaneously. With the major investments in reducing pollutant emissions behind it, the industry then shifted focus to reducing CO2 emissions and succeeded in reducing fuel consumption by about 8% over the last five years. Per tonne transported, this innovation has resulted in a fuel consumption of as little as nearly one litre of fuel per 100 tonne-km, delivering a significant reduction of CO2 emissions. Why is the truck market so complex? The end-use or ‘mission’ of trucks varies widely – they may for instance be used for long-haul or regional delivery, for construction or for municipality use. Depending on their mission, most trucks are custom-built on an individual basis in order to meet specific requirements, from the number of axles to the size of the engine and fuel tank, to the size of the cab or the height of the chassis. Furthermore, when we take the complete vehicle into account – the rigid body or a tractor plus trailer – the heavy-duty vehicle market becomes even more complex. There are literally thousands of shapes and sizes of trucks. Considering the complexity of the truck market, introducing legislation suitable for all variations is extremely challenging. 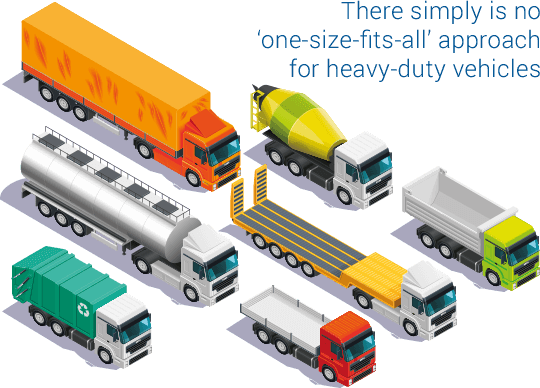 There simply is no ‘one-size-fits-all’ approach for heavy-duty vehicles. Trucks are not ‘big cars’. CO2 reduction policy for heavy-duty vehicles should therefore not follow the same approach as that for passenger cars. The shape of the vehicles, which depends on their daily ‘mission’. The same tractor or engine may end up pulling very different trailers and combinations, affecting the CO2 emissions of the complete vehicle.  The usage pattern of the vehicles and their cargo, in other words, ‘the work they do’. Is the road flat or hilly? with many starts and stops? All these variables result in different CO2 emissions. Why is fuel efficiency so important to the truck customers? Trucks and buses are economic goods, which makes fuel efficiency a key element in the purchase decision.  Fuel represents around 30% of the running costs in the transport sector. Given the competition between transport service providers for goods and people, strong economic incentives exist for fuel efficiency improvement. How will customer information be improved with VECTO? Giving customers transparent and reliable fuel consumption information based on a common testing method will allow them to select the most CO2-efficient vehicle. Since 2010, the European Commission has been working closely with the industry on a computer simulation tool (VECTO), which will model CO2 emissions from a wide variety of complete truck and trailer configurations. This means that VECTO will be able to reflect the complexity of the heavy-duty vehicle market, as it takes the variables into account that affect the CO2 emissions of complete vehicles. 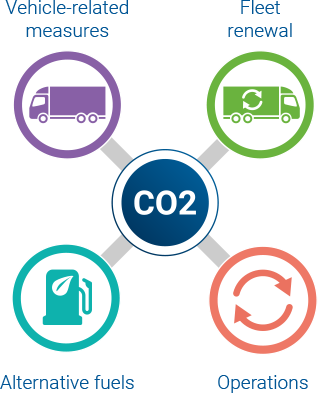 The upcoming EU legislation on the certification of CO2 from heavy-duty vehicles will require a mandatory declaration of CO2 values for each truck produced for the EU market, using this VECTO tool. This CO2 certification has a lot of potential to significantly reduce CO2 emissions from trucks, as it provides a credible, standardised way of comparing fuel efficiency. It will lead to increased transparency and competition among manufacturers, driving the market uptake of the cleanest vehicles. Before setting the direction for future CO2 reduction policy, we first need to have a clear understanding of the baseline – reflecting today’s level of truck CO2 emissions. VECTO is a necessary tool to close this knowledge gap. It is essential that policy makers give time to analyse the impact of this data collection and certification procedure before considering setting CO2 limits for heavy-duty vehicles. VECTO gives customers transparent and reliable fuel consumption information. VECTO allows customers to compare the CO2 and fuel efficiency performance of vehicles from different manufacturers. This means that transport operators can choose the most fuel-efficient vehicle more easily, helping them to lower the cost of running a fleet. The customer receives certified CO2 values for each truck purchased. VECTO stimulates innovation and competition among manufacturers to develop the most fuel-efficient vehicles. After all, end-users will be able to compare the offerings of different manufacturers by using VECTO results. VECTO provides a credible, standardised way of comparing fuel efficiency. It will also give a clear picture of progress in reducing CO2 emissions from trucks. Hence, VECTO ensures that the most fuel-efficient vehicle combinations are brought onto the market, thereby significantly reducing CO2 emissions from trucks. In 2008, the commercial vehicle industry made a commitment to reduce fuel consumption from new vehicles by 20% by 2020, compared to 2005. A recent study by Transport & Mobility Leuven (TML), confirmed that the industry is on track with reaching this target. However, the technology of new vehicles is just part of a bigger picture. Firstly, because new vehicles represent such a small fraction of the fleet, it is important to look at the entire vehicle fleet rather than just new vehicles. Secondly, there are many more factors than just the vehicle alone that determine CO2 emissions – such as permitted vehicle length and weight, trailer designs, alternative fuels, driver behaviour, transport operations, infrastructure, or a better utilisation of the vehicle (for example load optimisation), to name a few. A truly integrated approach would draw on this full spectrum of solutions to reduce CO2 emissions more effectively. 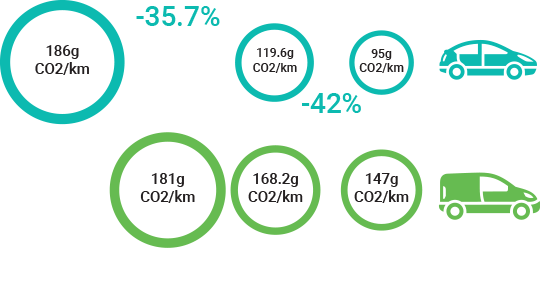 The TML study quantifies for the first time the reduction potential of this integrated approach, and estimates the potential gains to be more than double the CO2 reduction rate from a ‘vehicle only’ approach. The overall results of the study were validated by a consortium of 15 stakeholders who, together with truck manufacturers represent the different components of the integrated approach. The integrated approach is not just a theoretical concept, truck manufacturers have demonstrated the potential of these measures in real-life conditions. For five years, Transport Lab ran a fleet of some 25 vehicles from Sweden to Holland, implementing all measures that can help to reduce emissions – from vehicles and logistics, to driver training and alternative fuels. This test fleet achieved fuel consumption reductions of a full 50% between 2008 and 2013. By looking at all parts of a vehicle and trailer rather than focusing on a single component, the Efficiency Run tests found that each truck consumed around 12% to 14% less fuel than standard vehicles in each fleet. The tests also investigated the potential of long combination vehicles, and found that fuel consumption was reduced by around 17% compared with standard semi-trailer combinations. One of the most prominent candidates for a ‘quick win’ is driver training. At a minimal cost, the potential reduction can be as high as 7%. Better road infrastructure management and maintenance (think for example of improving the rolling resistance of roads or optimising traffic flows) can reduce CO2 emissions by 4%.  Smart and connected transport networks using intelligent transport systems hold great potential, for instance truck platooning. Revising maximum weights and dimensions to allow for the cross-border, EU-wide use of high-capacity vehicles, such as the European Modular System (EMS). Platooning is the linking of two or three self-driving trucks in convoy. The trucks closely follow each other at a set distance, using state-of-the art connectivity technology and driving support systems. The trucks in the platoon communicate with each other, using for example Wi-Fi technology, enabling them to travel in sync. The vehicle at the head of the convoy acts as the leader. If it brakes, all the other trucks in the platoon also brake. Reaction time is virtually one-on-one for all trucks. Platooning results in a lower fuel consumption and increased safety, as the trucks drive closer together at a constant speed, with less braking and accelerating. Truck platooning has the potential to reduce CO2 emissions by around 10%. Revising maximum weights and dimensions of heavy-duty vehicles has great potential. For instance, EMS has proven to be successful in all countries where it has been implemented: Denmark, Finland, the Netherlands and Sweden – with successful tests underway in Belgium, Germany and Spain. Using existing technology, EMS combinations can replace three trucks with two, resulting in a reduction in fuel consumption of about 15-25% (without safety being compromised or any damage to infrastructure). In some cases, safety was improved with EMS. Efficiency is currently constrained by the legal boundary conditions on maximum permitted weight, dimensions and speed. Therefore, changes to these legal boundary conditions would bring significant efficiency improvements. For instance, by further promoting a wider cross-border use of longer vehicle combinations in Europe. Improving the aerodynamic characteristics, for example, can effectively contribute to bringing CO2 emissions down by 3% to 4% by 2020 when compared to 2014 – of which 1.5% to 2% can come from the trailer. Low rolling resistance tyres can be retrofitted to any vehicle at little cost and provide fuel efficiency improvements up to 4%. The additional reduction potential of biofuels by 2020 (compared to 2014) is estimated to be 0.5% to 1.4%. In the long term, biofuels have the potential to realise a much higher reduction, but there is great uncertainty about how fast technology will advance and to which extent their increased usage will reduce (well-to-wheel) CO2 emissions. For instance, second-generation biodiesel is twice as efficient as common diesel. Gaseous fuels hold significant potential to cut CO2 emissions. Engines running on compressed natural gas, for example, can reduce CO2 by 10-15% on a per-vehicle basis. However, the market share of gas vehicles remains low for the moment, given the current lack of refuelling infrastructure. The automobile industry has succeeded in transforming both engines and many other components to increase fuel efficiency and reduce emissions from new vehicles. But the impact on total emissions from road transport is only felt when someone replaces an old vehicle with a new one (fleet renewal).  Besides the fact that fleet renewal is the most cost-efficient and, in practice, the quickest way to reduce emissions, it also stimulates consumption in Europe, which is one of the key drivers of GDP growth. How does the EU compare to the US? As European manufacturers are global players, they also produce trucks for the American, Chinese and Japanese markets. EU truck manufacturers implement the latest and best technology, wherever customers are asking for it. However, it is difficult to compare the CO2 emissions of EU and US trucks. This is because trucks are designed for their market-specific use, and freight efficiency is mostly determined by legal boundary conditions, which differ between the EU and US. In the EU, efficiency is currently constrained by the legal conditions on maximum permitted weight, dimensions and speed. Hence, road freight efficiency in Europe could be greatly improved by changing vehicle legislation. For instance, by allowing the cross-border use of longer combination vehicles in Europe, which is already common practice in the US, truck manufacturers would achieve a 14% higher fuel efficiency. Moreover, the lack of tractor length restrictions in the US results in an air drag benefit for American vehicles. Nonetheless, when using the weight metric, ie fuel consumption per tonne-kilometre (CO2 g/tkm), EU trucks emit 16% less CO2 emissions than US trucks. This metric is also known as the ‘work-done principle’. What is the Real Driving Emissions (RDE) Test? What progress has been made in reducing emissions? Why are there differences between lab tests and real world emissions? How will the lab tests work in the future? How do the lab tests work?? What emissions are being tested?  What is WLTP and how will it work? What is the purpose of lab tests like WLTP? What are the benefits of WLTP? From NEDC to WLTP: What will change? When will the WLTP changes take place? How to ensure a smooth transition to WLTP? The automobile industry remains committed to continuing to lower greenhouse gas emissions, through the development of more fuel-efficient technologies (eg variable valve timing, turbocharging, stop-start systems and direct injection technology) and ongoing investments into alternative powertrains. The EU has set the most challenging targets for reducing CO2 emissions from cars in the world. By 2021, CO2 emissions from new cars coming on to the roads will be 42% less than the new cars in 2005. This is ahead of the targets set by the EU for 2030. This comes on top of the significant CO2 reductions already delivered by car makers. In 2015 average new car emissions were 119.6g CO2/km compared to 186g CO2/km in 1995 – a 36% decrease in just two decades. These CO2 savings have been achieved in conjunction with decreases in pollutants such as nitrogen oxides (NOx) and particles (PM) through the introduction of the Euro standards – despite these initiatives requiring conflicting measures. Identifying the best possible response to the climate change challenge is a major priority for Europe. It is a key focus of the European Union’s ongoing policy development in the context of the 2030 Climate and Energy Framework, and is also important in relation to the international climate change negotiations. Under the 2030 climate and energy package, EU regulators propose ambitious political targets for reducing CO2 emissions. The automobile industry welcomes the European Commission’s decarbonisation initiative across all transport modes in Europe, and has already made significant improvements to new vehicle CO2 performance with an ongoing commitment to do more. However, manufacturers have little influence over how cars, vans and trucks are used. For this reason, Europe should consider a ‘whole of society’ approach that adopts an integrated strategy to tackling road transport emissions. This means not only reducing CO2 emissions from the vehicle itself, but also looking at all factors influencing emissions during the lifetime of the vehicle. Such a holistic approach will reduce CO2 emissions more effectively by drawing on a full spectrum of solutions, whether this relates to the vehicle itself, alternative powertrains, faster fleet renewal, intelligent transport systems (ITS), improving infrastructure or altering driver behaviour. Combined with the industry’s continuous improvements to vehicle technology, these measures have the potential to combat CO2 emission more successfully. The automobile industry has succeeded in transforming both engines and components to increase fuel efficiency and reduce emissions from new vehicles. As a result, emissions targets which exclusively focus on new vehicles fail to address the bulk of vehicles already on the road. For this reason, the automobile industry’s investments in more efficient vehicles will not come to full fruition as long as the potential of fleet renewal is not supported. Besides the fact that fleet renewal is the most cost-efficient and, in practice, the quickest way to reduce emissions, it also stimulates private and business consumption in Europe, which is one of the key drivers of GDP growth. Intelligent transport systems (ITS) in general and more specifically connected car technologies, are instrumental in empowering drivers to make optimal decisions with regards to driving. Real-time information that helps drivers make better decisions about routes to take, where to park and other driving decisions that are based on data provided by public and private providers. ITS and connected car technology can help lower fuel consumption, reduce costs, improve traffic flow and lower CO2 emissions. STAKEHOLDER DATA: Eco-driving systems can bring down emissions by 5-20%. STAKEHOLDER DATA: According to research by ERTICO - ITS Europe, in-vehicle eco-navigation systems (dynamic navigation tools that use realtime data to reduce fuel) have a 5-10% emissions reduction potential. Eco-driving systems – which recognise driving behaviour and provide the driver with on-trip advice and post-trip feedback – can bring down emissions by 5-20%. STAKEHOLDER DATA: In-vehicle navigation systems have a 5-10% emissions reduction potential. STAKEHOLDER DATA: Regarding infrastructure, the two highest-potential measures are traffic signal coordination and parking guidance. Giving drivers real-time advice on traffic signals and guidance to find a parking space could produce a further 10% savings in CO2 emissions for equipped vehicles in the areas where these systems are deployed. Reducing CO2 emissions by taking on road infrastructure is another possibility. While multiple methods exist, the biggest effect can probably be generated by ensuring that roads are well maintained, thereby keeping parameters such as macrotexture and roughness close to the optimal level. Limiting road gradients ex-post is generally not considered a cost-effective manner of reducing vehicle fuel consumption. Nonetheless, it should be taken on board as a factor contributing to emissions when building new roads. STAKEHOLDER DATA: Improvement potential of 1-2% by 2030. Both aim to encourage fuel-efficient vehicle operation, either through a change in intrinsic behaviour (training), or by providing instantaneous in-vehicle feedback and guidance (ADAS). STAKEHOLDER DATA: Eco-driving pathways could result in a 15% decrease of CO2 by 2030. STAKEHOLDER DATA: While both methods can have an impact individually, their combined effect is an approximate 15% reduction by 2030. These benefits are mainly seen in urban environments and at lower speeds, where accelerations and decelerations occur more frequently. On motorways, some benefits can come from free coasting as well. Improving transport infrastructure to reduce unnecessary kilometres driven - including urban design and traffic management schemes - is also key. But while market acceptance of alternative-fuel vehicles is rising, they still represent a very small share of vehicle sales in Europe. Promoting greater market uptake of alternative powertrains is therefore key to ensuring further reductions in average CO2 emissions. Governments across Europe will need to increase their support if we are to see a significant increase in sales, both in terms of helping to build the necessary charging infrastructure (by swiftly implementing the Directive on Alternative Fuel Infrastructure) and in influencing consumer choices (by harmonising customer incentives across EU member states). In the meantime, improving traditional technologies, such as the internal combustion engine, will remain an important contributors to CO2 reduction. It is also important to encourage the development of low carbon-intensive fuels (via the Renewable Energy Directive). STAKEHOLDER DATA: Electrically-charged vehicles could reduce CO2 emissions by up to 15% by 2030. STAKEHOLDER DATA: According to EURELECTRIC and other stakeholders, on a tail-pipe emission basis, electrically-chargeable vehicles (electric cars and fuel cell electric vehicles) could bring CO2 emissions reductions of up to 15% by 2030 compared to 2015. However, this will depend on how quickly some of the immediate challenges are addressed, such as the provision of electric vehicle infrastructure and support by utility providers and governments. If these challenges can be overcome, consumer acceptance of these new vehicle types could accelerate their wider adoption. With regards to the range of alternative powertrains, the principle of ‘technology neutrality’ must be kept, as there is no one-size-fits-all solution covering all possible consumer choices and business needs. This is particularly clear when comparing cars, vans and trucks: solutions for small city cars for instance do not work for trucks. STAKEHOLDER DATA: Based on assumptions by the European Biodiesel Board (EBB) and other stakeholders, advanced biodiesel could also produce CO2 emissions reductions of up to 15% across the car fleet by 2030. Bioethanol could cut CO2 emissions by further 10% if E20 fuel were to be developed commercially, according to estimates based on ePURE figures. Methane, meanwhile, could produce 7% of CO2 reductions by 2030. WHY DO WE NEED A MORE EFFECTIVE APPROACH? The current system has limited environmental benefits, as it focuses on new vehicle technology alone. A more effective approach will look at the full fleet and how it is used. In other words, we need to adopt an integrated approach to tackling road transport emissions. This means focusing not only on reducing emissions from new vehicles, but also on factors influencing emissions throughout the lifetime of the vehicle. New measures should be more effective and balanced, whilst safeguarding industry competitiveness. Looking ahead, the relative costs of reducing carbon emissions must be similar and proportionate across all sectors. CO2 reductions should be balanced between ETS (the EU emissions trading system) and non-ETS sectors, across transport modes, and in Europe versus the rest of the world. STUDY SHOWS: By 2020, average emissions of new passenger cars will need to be reduced by 39% compared to their 2005 level.  And while the automobile industry is dedicated to achieving this goal, it should be noted that this compares to a 10% reduction expected from other non-ETS sectors (including buildings, agriculture and waste) and a 21% reduction expected from ETS sectors (such as power stations and combustion plants) during the same timeframe. The automotive industry is a key pillar of the European economy, contributing 6.3% to the EU GDP and, directly and indirectly, employing 12.2 million Europeans (5.6% of total EU employment). Given the range of factors that contribute to the level of CO2 emissions from each individual vehicle, and the fact that further investments by the automobile industry will come at a growing cost, it makes no sense for the full burden of reducing CO2 emissions to be borne by the automobile industry alone – especially in the context of a highly competitive global market in vehicle manufacture. The automotive industry is one of the most regulated sectors in Europe - subject to around 80 EU Directives and over 70 international UNECE regulatory agreements. Regulations relating to safety, the environment, type approval of vehicles and taxation have already added significantly to the industry’s costs. Effectively joining forces to reduce CO2 emissions will allow us to drive down total road transport emissions, but will also ensure that Europe’s strategic automotive industry retains its competitiveness in the decades to come. Therefore, policymakers should assure that comparable efforts are made by all sectors. Car prices have, over the same period, increased only in line with inflation. From being the most profitable region in 2007, generating €15 billion profits, the European region became the least profitable, with aggregated losses of €1 billion in 2012. STUDY SHOWS: McKinsey estimates that between 1998-2011, regulatory requirements and other improvements such as ESP, airbags, fuel efficiency improvement and weight reduction increased production costs by 3-4% per year. More recent environmental regulations, such as the new noise limit, eCall, the 2020 CO2 target and Euro 6 with the Real Driving Emissions (RDE) test, are expected to add a further 24% to the manufacturing costs of a car by 2020.